The Metropolitan Asylums Board was set up in 1867 to administer care for certain categories of the sick poor in metropolitan London. However, this responsibility did not initially extend to the provision of ambulance services to carry patients to or from its institutions. This changed in 1879 when a new Poor Law Act empowered the Board 'to provide and maintain carriages suitable for the conveyance of persons suffering from any infectious disorder'. In May 1881, before a new ambulance service was set up, there was a smallpox outbreak in the capital. 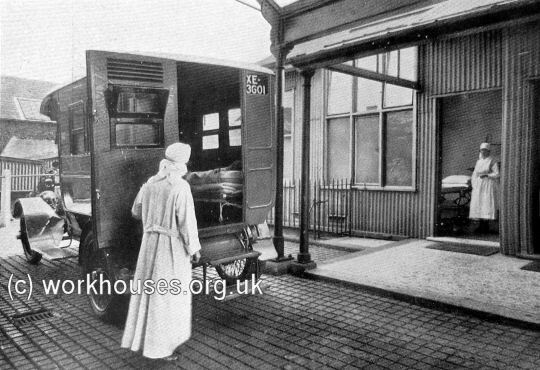 Horse-drawn ambulances were hired to convey patients from Deptford Hospital to a tented smallpox hospital at Darenth, near Dartford — the eighteen-mile journey took three hours. A Royal Commission was appointed in 1881 to examine the arrangements for dealing with infectious diseases in the capital. In its report the following year, it recommended that smallpox cases should be treated in isolated hospitals on the banks of the Thames or in floating hospitals on the river itself. In 1883, the MAB set up three hospital ships moored at Long Reach near Dartford, 15 miles below London Bridge. To provide a more efficient means of transporting smallpox patients to and from Long Reach, and to the convalescent hospital at Gore Farm, four miles beyond, a new river ambulance service was created. The South Wharf at Trinity Street, Rotherhithe, served South London. It opened in December 1883. The North Wharf at Manager's Street, Blackwall, served Central, North, and East London. It opened in January 1884. The West Wharf at Carnwath Road, Fulham, served West London. It opened in February 1885. Rotherhithe was also the headquarters of the river ambulance service. The plan below of the south wharf at Rotherhithe shows the general arrangement of the wharves. A floating pier, approached by a 300-foot long bridge, was placed so that there was sufficient water for steamers to come alongside at all times of the tide. At the land end of the pier was a covered shed into which ambulances drove, with an examination room. If the medical officer of the river service considered that patients were in a condition to bear the voyage, they were carried down to the steamer waiting alongside the pier, and placed in a bed. 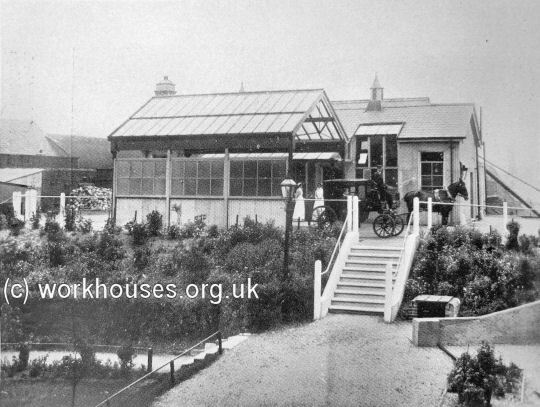 The land facilities at Rotherhithe were expanded to include several shelters where patients in transit could be accommodated overnight if necessary. Ambulance delivering patient to South Wharf, early 1900s. The South Wharf site at Rotherhithe is now the site of the dockland's City farm. 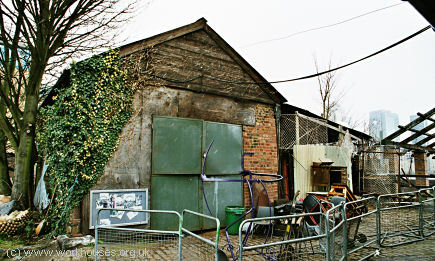 One small shed at the north-east of the site still survives from the river ambulance days and is now used as a blacksmith's shop. The river ambulance service began with a fleet of four paddle-steamers — the Red Cross, the Maltese Cross, the Albert Victor, and the Marguerite. The Marguerite was a 73-foot vessel acquired in 1884. She was used for carrying visitors and ships' staff but was apparently not successful and was sold off in 1889. The Red Cross was the first steamer to be specially built for the Board with her first voyage taking place in February, 1884. Her dimensions were: length 105 feet, breadth 16 feet 6 inches, and draught 4 feet. 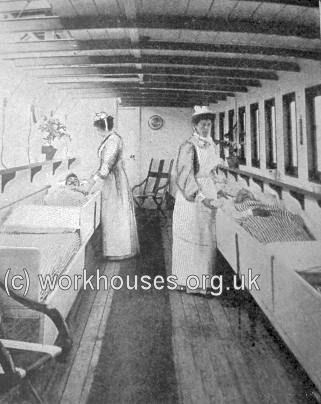 The hospital was in the fore cabin, and was divided by a bulkhead into two equal parts, each containing eight beds for adult acute cases. The after cabin was intended to receive recovered cases returning to London, but once the Albert Victor was fitted for ambulance service and used for the conveyance of these cases, the after cabin was designated for mild cases who did not need to lie down. The Maltese Cross, also built for the Board, came into service in October, 1884, and used an improved design after experience gained with the Red Cross. Her dimensions were: length 132 feet, breadth 16 feet 6 inches, and draught 3 feet. There were two hospitals fore and aft, each containing 16 beds for acute adult cases. The Albert Victor was purchased in May, 1884, from the London Steamboat Company and fitted out as a hospital. Her dimensions were: length 132 feet 6 inches, breadth 17 feet, and draught 4 feet. As in the Maltese Cross, both fore and aft cabins were fitted as hospitals with 16 beds each for acute adult cases. She was principally used for bringing recovered cases back to London. In 1902, she was converted to carry up to 300 non-patients. In 1894, the fleet was enlarged by the addition of the Geneva Cross, another purpose-built paddle-steamer. She was 143 feet long, 22 feet wide, and with a draught of 5 feet. In her stern she had an upper cabin for 16 acute patients in two compartments, and a lower cabin for 36 patients in two compartments. There was a fore cabin for carrying visitors. 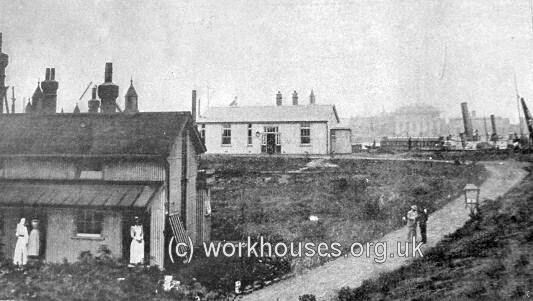 Geneva Cross saloon hospital, 1902. Geneva Cross saloon hospital, early 1900s. In 1896, a screw-drive steam pinnace (a tender) called the White Cross was acquired for general use. In 1897, the Red Cross was sold and in 1902 a replacement vessel Red Cross II was purchased from the London and South Western Railway. Red Cross II, originally named Solent, had been built as a 300-seat passenger vessel for the Southampton to Lyminge route but her draught had proved too great for Lyminge at low tide. She was converted to hold 68 beds, although in non-epidemic times, her fore cabin was used by staff and visitors. 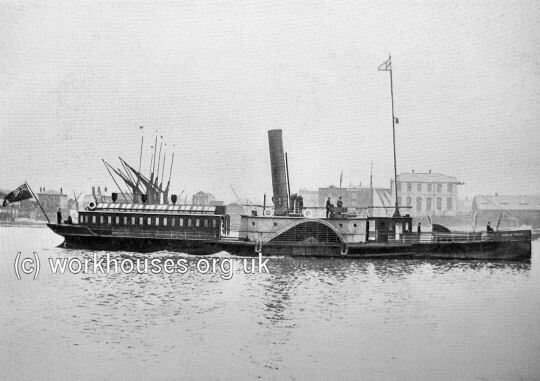 During the 1902 smallpox epidemic, a further paddle steamer called the Conservator was acquired but was disposed of in November, 2003. 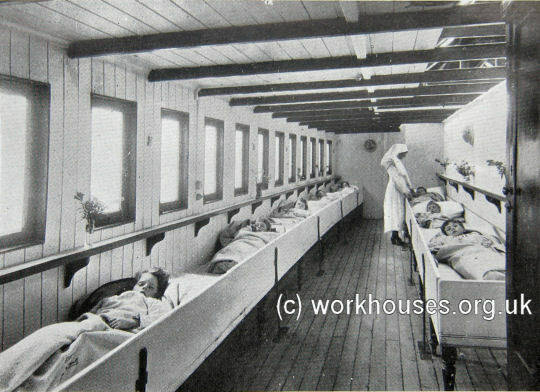 All the steamers had cabins for the nurses, and facilities for the treatment of severe cases including the supply of appropriate nourishment. 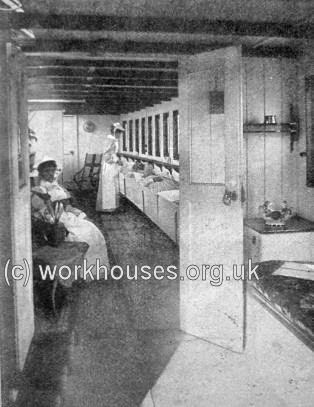 On deck was a cabin for the medical officer, and accommodation for the captain and crew. The steamers were designed to be easy to navigate in the river often crowded with shipping. Even so, repairs were often required because of collisions with other, less careful vessels. At most times, the ships ran once a day but worked non-stop during epidemics. The steamers' speed was ten knots an hour and the voyage from the south wharf at Rotherhithe to Long Reach took between an hour and a half to two hours. 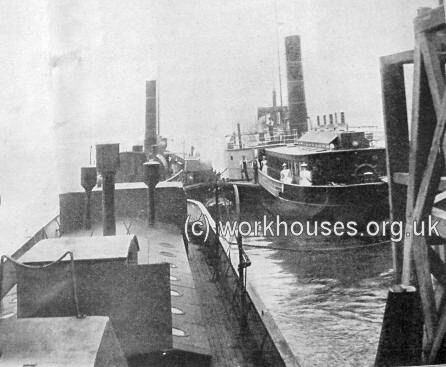 Bad weather often caused delays, as the steamers were unable to sail during the thick fogs that then often enveloped the Thames. Although highly inconvenient for patients, such delays did not usually last more than a few hours. During a big freeze in February, 1895, the service was completely suspended for two weeks because of huge sheets of ice floating on the river. Patients were marooned at the South Wharf but fortunately it was an epidemic-free period. One of the smaller vessels was fitted up as a chapel as a results of the efforts of Miss Isabella Baker who was appointed 'lady superintendent' during the 1884-5 smallpox epidemic. She had been disturbed to find that no provision existed for religious services for the patients and had funded the installation of a ship chapel in conjunction with her friend John Henry Bridges of the Local Government Board. Use of the river ambulances varied enormously. Their busiest year was 1902 during a major smallpox outbreak. In 1907, their quietest ever year, only one patient was transported. Following the steady decline in smallpox cases, the river service was reorganized in 1913. The North Wharf became the sole departure point for the smallpox ships, with the South Wharf accepting only general fever cases. In 1930, the river ambulance service passed into the control of the London County Council but was disbanded in 1932 after carrying more than 45,000 patients to Long Reach. Most of the old ships were sold for scrap to Russia. The dossal and frontal from the ship chapel were kept and preserved at the Joyce Green Hospital. National Maritime Museum web site.